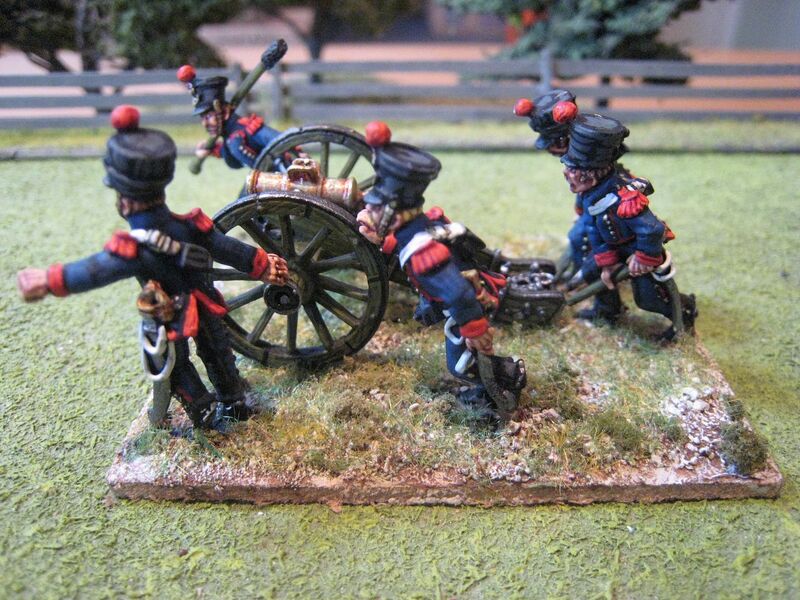 Last year I painted 2 brigade command sets using figures from the Foundry French Napoleonic range. Foundry sell various "generals" and "mounted officers" packs, which seem to contain a mix of pre- and post-1812 uniforms. Initially I didn't know what to do with the pre-1812 figures, but a bit of research suggested that they would be ok for officers of the Imperial Guard, many of whom seem to have continued to wear cut-away coats rather than the Bardin coat. So I picked out various figures to turn into the two brigade command stands that one requires for the Young Guard units that were present at Waterloo. This is the first of those. Now, I have to confess to being rather confused about how the Imperial Guard was organised in practice at Waterloo. The regiments don't appear to fall easily into a division/brigade organisation like everything else. Officers who are listed as "brigade" commanders in one orbat appear as a "division" commander in another; and to add to the confusion, because Imperial Guard officers held a higher rank than their equivalents in the regular army, their rank isn't a clear indication of what body of units they commanded. A further problem with the Young Guard is that sources can't agree on whether the 2 brigades each contained a regiment of tirailleurs and voltiguers or whether all the tirailleurs were in the first brigade and all the voltigeurs in the second. All very confusing. In the end, I decided to follow the splitting up of theTirailleurs and the Voltigeurs across the 2 brigades. So the first brigade, under General Chartrand will have the 1st Tirailleurs and the 1st Voltigeurs, whilst the second brigade will have the 3rd regiments of both. Chartrand was born on 22 January 1779 and joined the army at the age of 14 (I love his christian name, particularly "Hyacinthe" - to English-speakers, Frenchmen sometimes have rather feminine sounding names...). He rose swiftly through the ranks and by July 1813 was colonel of 25th Line Regiment. He was promoted to General-de-Brigade later that year. He appears to have met an unfortunate end, being executed on 22 May 1816 for rallying to Napoleon's cause in 1815. The mounted officer here is not dressed as a General de Brigade, rather as a colonel of the Tirailleurs of the Guard (the cuffs are correct for this; if he was a colonel in the Voltigeurs he would have pointed cuffs like the legere infantry). I have no idea whether Chartrand was actually ever a colonel in the Young Guard, or whether his rank was sufficient to have him assigned to the Young Guard's first brigade. The foot figure is another Foundry sculpt, and it's not clear to me whether he is wearing the pre-1812 coat or the Bardin jacket but with the buttons undone (there are a couple of figures in the range that clearly have their coats unbuttoned). 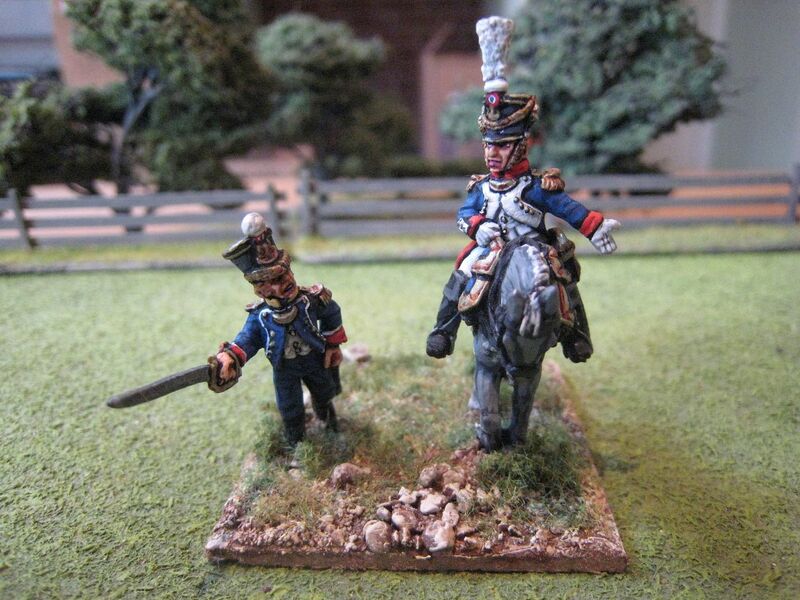 I thought I'd portray him as the latter; a rather flustered adjutant of the Voltigeurs (note the correct pointed cuffs) who has lost his horse and has come to tell Chartrand that the situation at Plancenoit isn't going too well. The uniforms aren't perfect for who these people are supposed to be, but they were the best use I could think of for these particular figures. 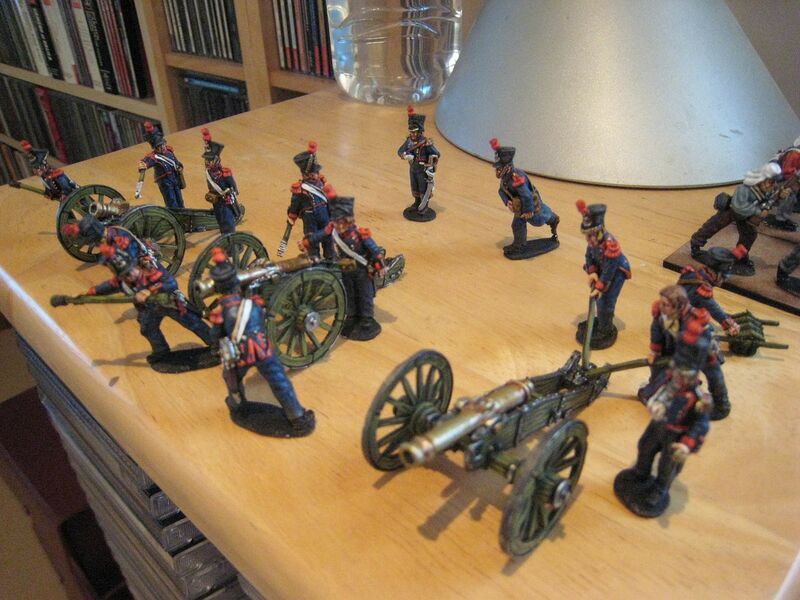 And it gives me an excuse to paint some more Young Guard (all I have so far are some Voltigeurs having a rest)! 2 figures. Painted August 2012. 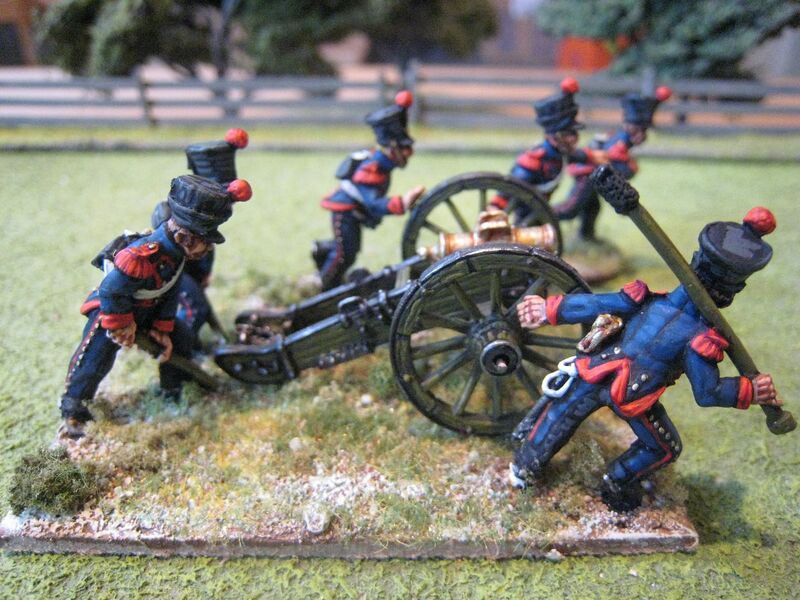 I've spent a large part of the past couple of months painting Perry 1815 French artillery. Whilst I finish basing those figures (a total of 9 guns and crews), here is something I painted earlier last year. This is the Foundry French horse artillery set, still sculpted by the Perries (or at least one of them), but with the figures slightly smaller and chunkier than their later ones. The set represents a crew "running up" a howitzer. I really like the dymanic poses of the crew, and I'm a bit surprised that Alan Perry hasn't replicated this "pose" in his Perry Miniatures 1815 French range. 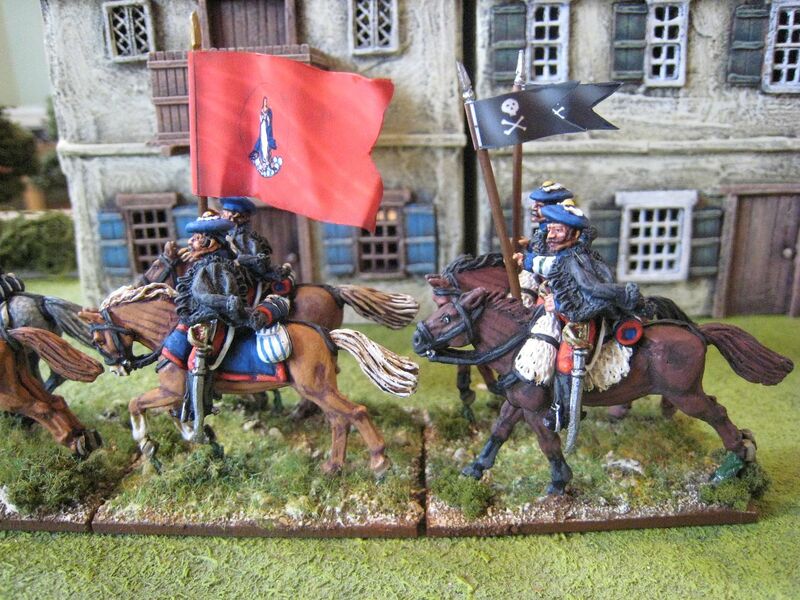 I'll post a few thoughts on French horse artillery generally when I post pics of the 2 Perry sets that I have just finished. 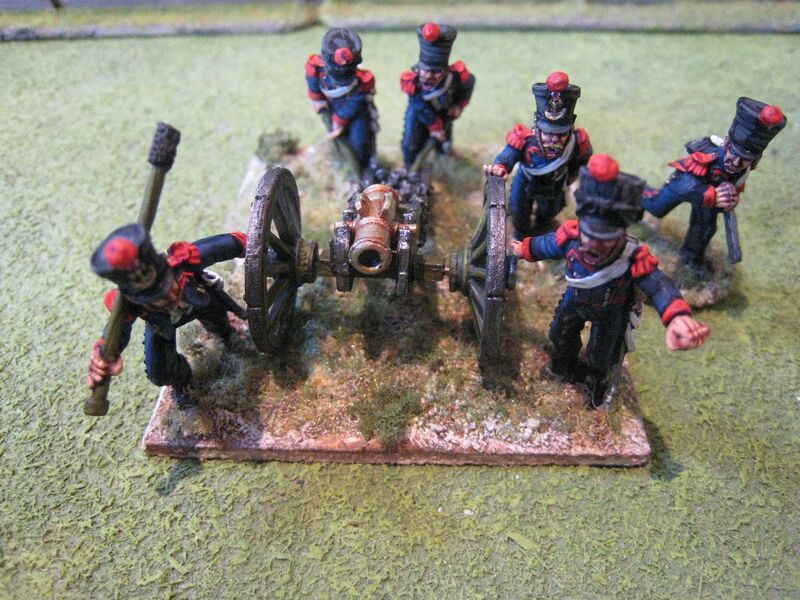 I base artillery on 70mm x 60mm bases (as per the "General de Brigade" rules), with 1 gun and 4 crew. The Foundry sets give you 6 crew figures so I usually detach one or two and place them on pennies (see the foot artillery set here) so they can float around as required. With this set, 5 of the 6 crew figures had to be in contact with the gun itself, so they all went on the base. I appreciate that aesthetically it can be more pleasing to have deeper or wider bases for artillery pieces, and I plan on doing so for 12-pounders and above. However, most of my crews will be 4 figures and those fit comfortably on a 70 x 60 base. There will be ammunition caissons and supernumeries behind the guns to add some depth to the artillery park. For the last (or rather first) French artillery set I painted I used the Foundry "authentic French artillery green" palette and I thought it didn't work at all. 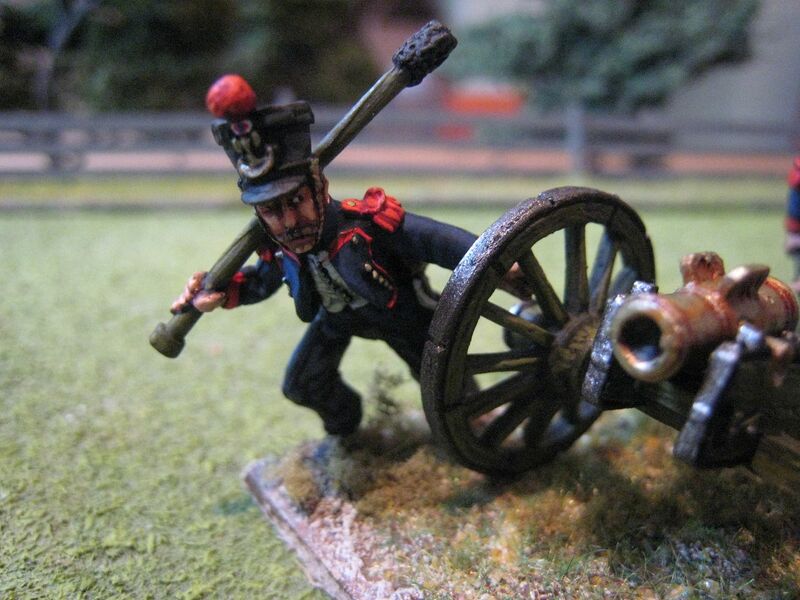 I experimented with some Vallejo colours when I painted some Carlist War artillery, and I've continued with those colours. I've started repainted the earlier foot artillery set with those colours, including the equipment carried by the gunners which I had painted as "natural wood". 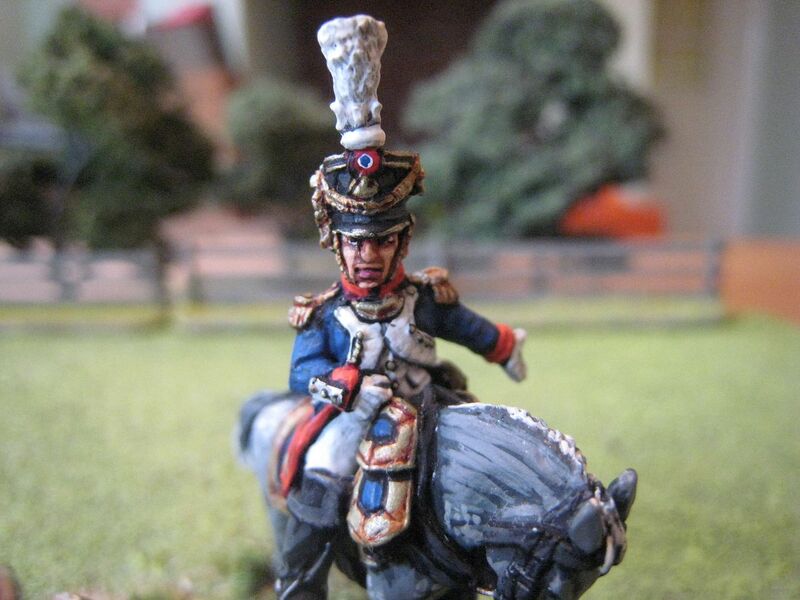 I'm still badly behind on posting about things I painted last year - lots more 1815 French to come over the next couple of weeks. 6 figures and 1 gun. Painted October 2012. 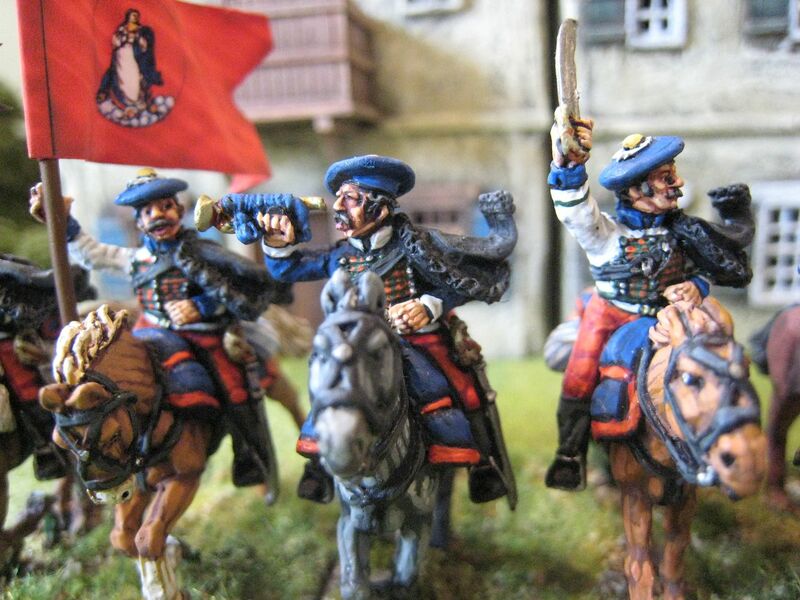 This is my first unit of cavalry for the First Carlist War, the Ontoria Hussars on the Carlist side. Here's what the Perry/Cairns book says about them: "200 strong, organised in 1838 by General Balmaseda as part of the Army of the North. After the convention of Vergara [August 1839], he led his men to join Cabrera, and the unit joined the Aragonese division." The Convention of Vergara was the agreement that formally ended the war, but the Carlist general Ramon Cabrera continued fighting and in 1840 led the remains of the Carlist forces under his command into France and exile. Therefore, this is a pretty late unit, of limited use. However, the uniform is very dashing and smart and according to the gentlemen on the Carlist Wars Yahoo group there is evidence that these troops carried "death's head" lance pennants. This unit had an "elite" reputation, so all in all these chaps are rather fearsome. At a ratio of 1:30/33 I thought 6 figures was enough for a unit of around 200 men. 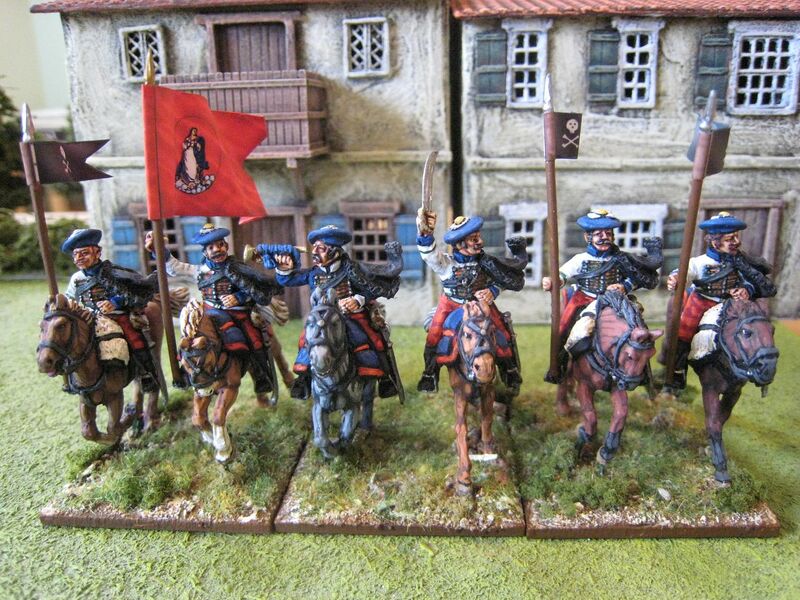 I think most of my Spanish cavalry units will have 6 figures (rather like the AWI). Perry Miniatures figures, of course. 6 figures. Painted August 2012. Lance pennants and flag by Adolfo Ramos. From a blogging perspective, 2012 was a disasterous year. I barely averaged 3 posts a month and I seriously loss interest for weeks on end. I'm still not entirely sure why. Part of it was certainly down to losing the ability to create blog posts at work as a result of new anti-abuse software (yes, I know doing this sort of thing at work is an abuse anyway, but the result was that I couldn't anymore access photos, or sometimes even my blog itself), and finding it difficult to pick things up at home in the evening. Part of it was difficulties in finding the right space to take photos in our new house, particularly given the lack of sunshine in the UK last year (from a weather perspective, 2012 is now officially the most dismal, wet, grey and generally depressing year in over 100 years). Blogger and Photobucket, with their endless tinkering, were a further problem; even now, I till find it difficult to post comments on some blogs - I write the comment, analyse and type the "prove you're not a robot" thing and then the comment just vanishes. Finally, there was simply wavering interest: 6 years is a long time to run a blog and there were times when other things just seemed more important. I'm very grateful for the readers who've continued to follow, and comment on, this blog despite it going awol for long periods. I really appreciate the support. Wargaming action was very light last year. I can't now recall whether I had a game - if so, it would have been a 15mm Austerlitz game at Eclaireur's around this time last year, but that game may actually have been at the very end of December 2011. I also attended only 1 show - Salute, it appears, will now be my only regular show attendance. I did keep painting, however (which makes the last of posts even more idiotic), with units completed for all my core periods. I'm currently trying to finish off some Perry French Napoleonic artillery packs (wip photo opposite), before launching into AWI highlanders for both my own collection and Bill Nevin's. 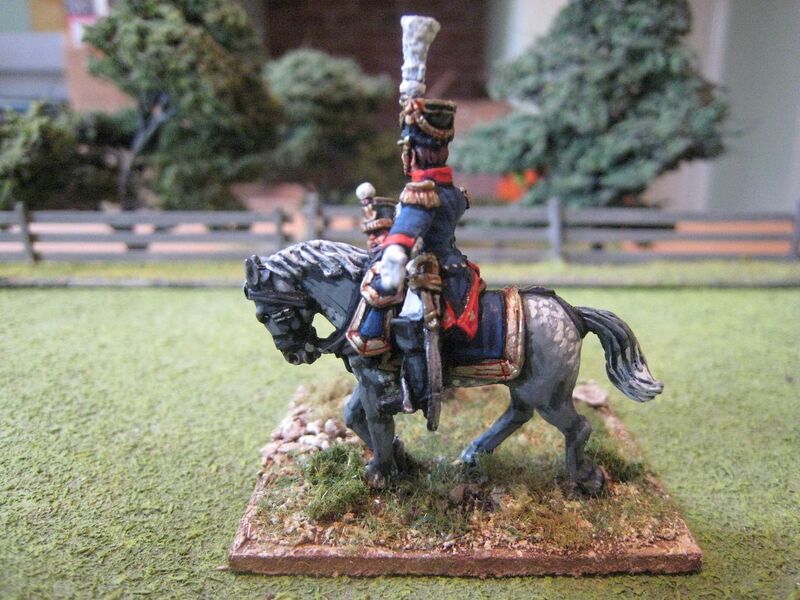 - AWI: 8 foot, 8 cavalry. - 1815: 50 foot, 5 cavalry and 4 guns. - First Carlist War: 94 foot, 18 cavalry and 3 guns. 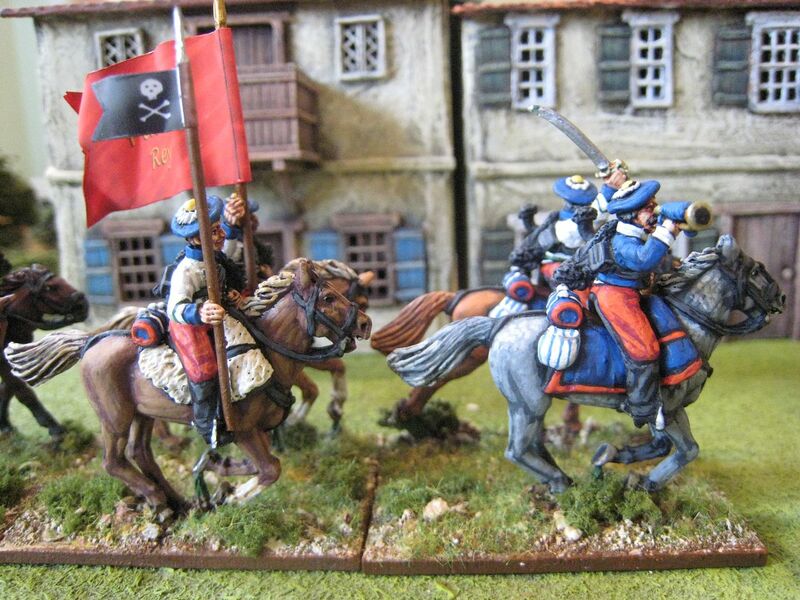 - ECW: 2 cavalry (I really must post about these 2 command stands I painted last January!). - ACW: 120 infantry (I really must post about these as well!). That gives me 352 points, which is better than 2010 but 30 points fewer than 2011. It's still miles away from the heady days of Life Before Children: in 2009, for example, I reached 524 points. Still, the 2012 tally equates to 6.7 figures a week, which isn't that bad, I suppose. I was pleased to have made some progress with my Carlist War collection and felt very virtuous at painting the 100-odd ACW figures from my leadpile. I kept wargaming purchases to a minimum - the only figures I bought were those I acquired at Salute (admittedly a fair number) and a small Perry order for figures to finish off a couple of units. 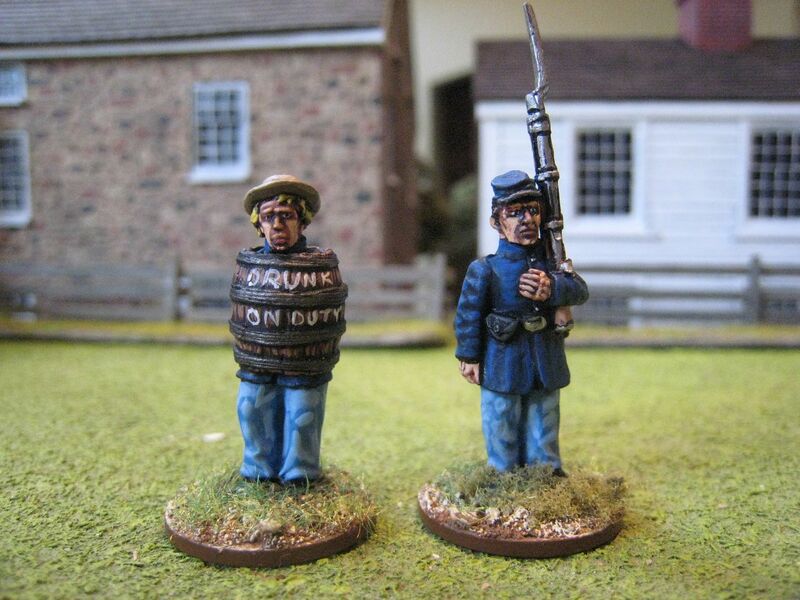 2013 is going to be a good time to kick-start this blog, as it can't be long now until the Perry plastic AWI British infantry are released. Alan is clearly working on the metal side of the AWI range again, and Bill Nevin of King's Mountain Miniatures has released his extensive highlander range with the teaser of new figures to come later this year. I still have half a dozen Eureka American dragoon units in the lead pile, together with Perry French and a few other things. So I anticipate that 2013 will see this blog return to the AWI is some style. That will result in much lower activity on the First Carlist War. 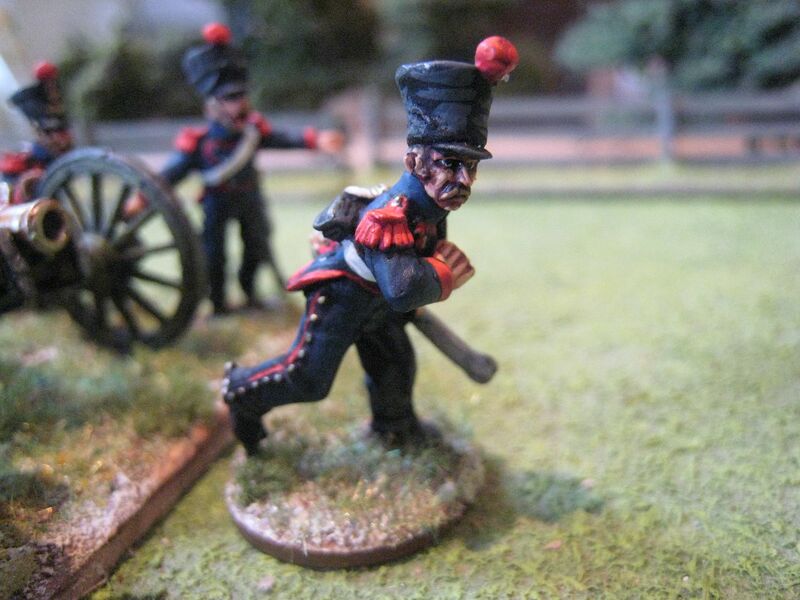 My 1815 work is already largely contained by Perry Miniatures having moved away from the Waterloo campaign to the 1809-12 period; so I can concentrate on painting what I already have and not buying anything new. Similarly, I have no ACW expansion plans at the moment. Other bits and bobs will probably come and go - for example, I understand Empress Miniatures are going to release a third wave of NZ Wars figures, which might make an interesting diversion for a month or so. All that, however, is subject to something else which I'm not sure I mentioned last year: the Kiwi and I are expecting our second child in about 5 weeks. The due date has come around ridiculously fast, and I have no idea what's going to happen to my painting time when the little one arrives! And talking of Kiwis, I can now look forward to another trip to NZ later this year (that will be my 7th visit - more times than I've been to Paris!). 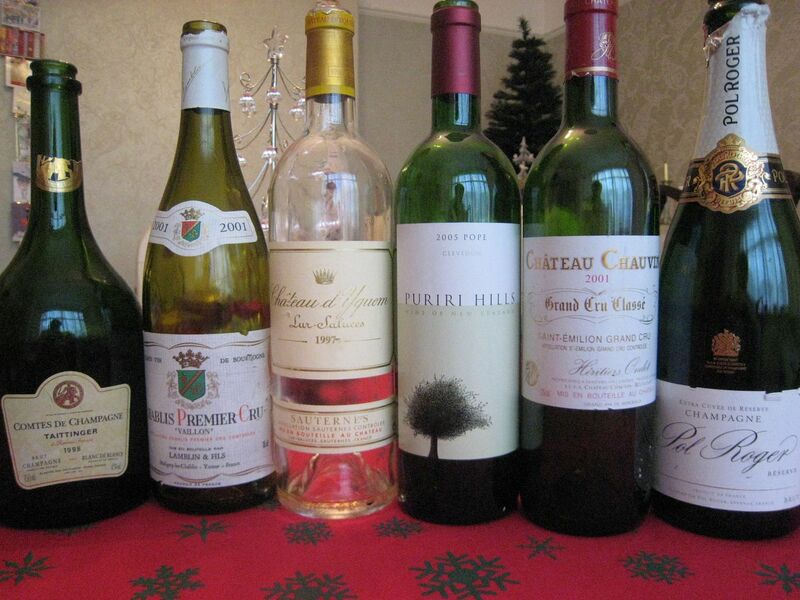 Finally, because I know one or two readers are interested in such things, I thought I'd post a couple of photos of my family's Christmas Day drink selection. Rather anally, I take photos every year but usually keep them to myself. My father always provides the wines (I now provide all the wine for the extended family pre-Christmas meeting, which is in mid-December to celebrate Hugo's birthday). 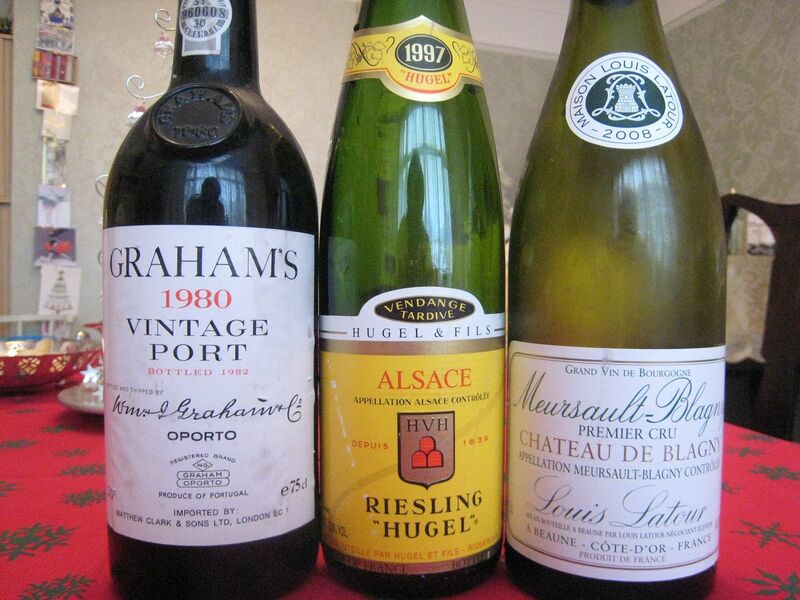 The standard format is champagne, then white Burgundy, red Bordeaux and then "stickies" and port. Some years ago my father bought a case of Chateau d'Yquem 1997, considered to be one of the best vintages of the 1990s, and each Christmas we have 1 bottle. It really is fantastic stuff, more luscious each year but never cloying. Since 2010 our reds wines have been one or more clarets and then some wines from a boutique NZ producer, Puriri Hills. Located in Clevedon, just south of Auckland, Puriri Hills is a winery that has a luxury cottage in which my parents stayed for a couple of days before flying back to the UK after my wedding in March 2009. My father developed DVT on the flight over from the UK and he spent the week before our wedding in Auckland General Hospital. Judy and her team at Puriri Hills looked after my parents very well during their stay and my father has been a loyal customer ever since. That's good news for the rest of the family, because Puriri Hills make absolutely top-end stuff. The flagship wine, only released in exceptional years, is a Bordeau-blend called "the Pope" (named after a former winemaker, not the Pope). This Christmas we finished off our last bottles of 2005 Pope and, as with last year, it knocked the socks of the (quite excellent) 2001 Chateau Chauvin from Saint-Emillion. Pope costs about £100 a bottle, but it's one of NZ's best wines so don't ever pass on an opportunity to have some. But even the Pope was denied gold position this year by the port, Graham's 1980. For a 30-year old wine it still tasted very fresh and was wonderful. The [ ] Hugel riesling, from Alsace, wasn't at all bad either; at the end of its prime, perhaps, but the acidity and sweetness were well-balanced and it made a good foil to the d'Yquem. Lastly comes Louis Latou's Chateau de Blagny 2008, another white Burgundy that I confess I largely polished off myself whilst watching "Downton Abbey". A 2008 Meursault is a bit on the young side now, but this was nonetheless excellent with a good life ahead of it. I found out the next day that this bottle in fact belonged to my brother, who'd bought a case to be put it aside for investment purposes and for some reason kept it at my parents' house - how I came to have consumed this bottle is one of those mysteries lost in the haze of Christmas Day lunchtime drinking!